TORONTO, March 27, 2018 /CNW/ - Fresh off a win at the Canadian Whisky Awards, J.P. Wiser's Dissertation landed a second consecutive win at the World Whiskies Awards in London, England on March 22, 2018. 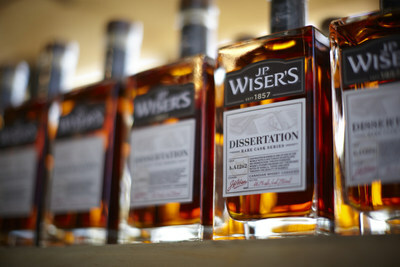 J.P. Wiser's Dissertation won the Best Canadian Blended Whisky. This whisky was developed exclusively for Ontario and under 2,000 cases were produced, making this a rare and rewarding find! Corby Spirit and Wine also received three more honours during the ceremony in London, awarded to: J.P. Wiser's Toffee Whisky, Gooderham and Worts Little Trinity 17 Year Old, and Lot 40. "We believe that Canadian whisky represents Canada well: like our country, we believe that diversity is our strength. I am proud to create a wide range of beautifully blended whiskies with unique flavours so that everyone can find one to love," says Master Blender, Dr. Don Livermore. "I am very pleased that our brands of whisky are recognized on the world stage." In 2017, J.P. Wiser's Dissertation won Best Canadian Blended Limited Release. In 2016, Gooderham and Worts won Best Canadian Blended Whisky. This whisky is crafted to enhance the flavours that naturally come from oak barrel ageing to deliver a rich, smooth toffee and butterscotch taste that is best enjoyed neat or on the rocks. With limited bottles produced, this whisky is as hard to find as it is delicious! Corby Spirit and Wine Limited is a leading Canadian marketer and distributor of spirits and imported wines. Corby's portfolio of owned-brands includes some of the most renowned brands in Canada, including J.P. Wiser's®, Lot No. 40®, Pike Creek®, and Gooderham & Worts® Canadian whiskies as well as Lamb's® rum, Polar Ice® vodka, McGuinness® liqueurs, and the recently acquired Ungava® gin. Through its affiliation with Pernod Ricard S.A., a global leader in the spirits and wine industry, Corby also represents leading international brands such as ABSOLUT® vodka, Chivas Regal®, Aberlour® and The Glenlivet® Scotch whiskies, Jameson® Irish whiskey, Beefeater® gin, Malibu® rum, Kahlúa® liqueur, Mumm® champagne, and Jacob's Creek®, Stoneleigh®, Campo Viejo®, and Kenwood® wines. In 2017, Corby was named one of the 50 Best Workplaces in Canada by The Great Place to Work® Institute Canada for the sixth consecutive year. Corby is a publicly traded company based in Toronto, Ontario, and listed on the Toronto Stock Exchange under the trading symbols CSW.A and CSW.B. For further information, please visit our website or follow us on LinkedIn, Twitter (@CorbySW) and Instagram (@CorbySW).